After reading a glowing review of this book in a UK music magazine, I knew I had to give it a shot. Being the late bloomer that I am, Bauhaus had only had a minimal spot on my favorites list before I took the time to fully explore their discography. The exception to this is Peter Murphy, who has, up until recently been very high on my favorites list...but that's another blog post. I was hoping for some insight on Bauhaus with this book, and I got it. I was hoping for a little inside dirt on the band, and I got it. But there's a lot more to this book than just dirt and reliving the exalted past. David J is a very introspective writer, and I appreciated his openness and honesty, even when the road was rocky. And, of course, the road was indeed very rocky. If you have even only a casual interest in Bauhaus, I'd still recommend this book because it gives a great overview of the times, knowledge of how the record companies really work, and a little taste of the esoteric. The occult, in this case. Which may be a slight turn-off to some, but David doesn't spend too much time on this subject, so don't go running for the hills if that isn't your cup of tea. You can simply skip over the chapters/areas where he discusses it, and not miss anything too critical. The one problem I had with the book was the glaring number of typos, misspellings, grammatical errors and the like, It astounds me that in this day and age, these things only seem to be getting worse. It's like it's an accepted flaw, and I just can't see my way through that. As an amateur writer, I would be mortified if the book I had poured my heart and soul into were printed full of these kinds of mistakes. Rant over. 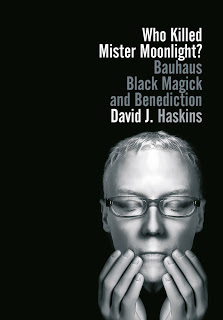 Give it a read, and put on a Bauhaus (or David J) record while you're at it.